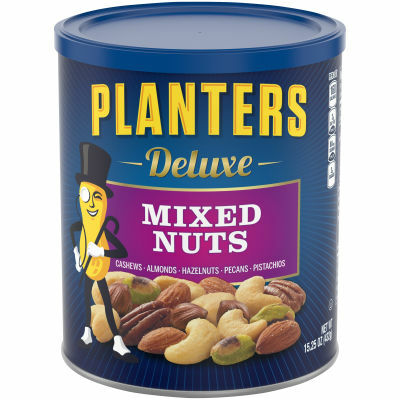 Enjoy this crispy, salty mix of deluxe nuts by Planters. Cashews, almonds, pecans, pistachios and hazelnuts work together to create a wholesome and unique flavor in each bite. Each of the five premium nuts in this mixture is enhanced with a dash of sea salt to give you a burst of salty flavor. - Available in an 15.25 oz. resealable canister, this deluxe nut mixture stays fresh whether you're grabbing a handful for a quick snack or to pack into your child's lunch bag. Serving size 1 oz (28g/about 22 pieces).